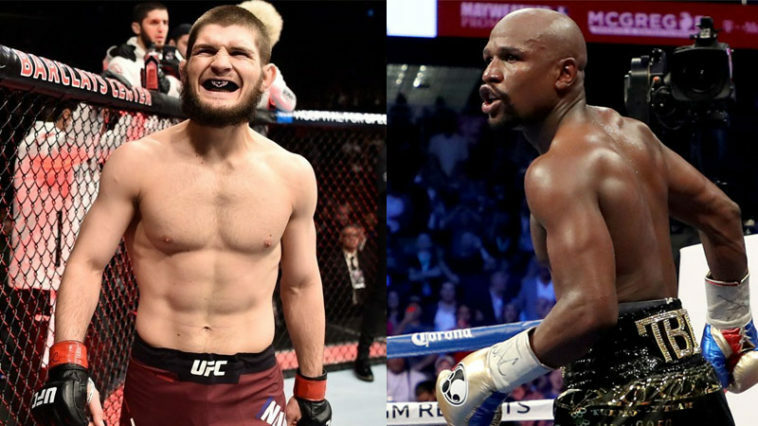 After only just defending his UFC lightweight belt against Conor McGregor undefeated Khabib Nurmagomedov has his eyes on another champion. However, rather than just crossing promotion, the Russian wants to cross sports entirely and fight 57-0 pro boxer Floyd Mayweather. According to Ellerbe, the footage was captured during a fight show in Nurmagomedov’s native Russia. Khabib says the pair, who have both fought and beaten McGregor, must scrap as undefeated titleholders. The UFC lightweight champion doesn’t actually state what sport he offers the challenge in. Floyd has competed in 50 professional boxing contests but so far hasn’t stepped inside a cage. There were talks about an MMA bout being in the works featuring McGregor vs. Mayweather. However, nothing got past the initial talking phase, with Mayweather apparently requesting special rules and negotiations never being me. Many believe it was a hype move. Floyd, himself an undefeated champ, has fired back at Khabib. According to the athletes Twitter account, he’s open to taking the fight if the price is right. They certainly don’t call him ‘Money Mayweather’ for nothing. Following on from the post-fight brawl at UFC 229, Floyd didn’t show much support for Khabib’s actions. “McGregor is a tough competitor but McGregor’s opponent jumped out of the ring and was fighting people in the crowd so… very unprofessional,” said Mayweather to Abu Dhabi’s ITP Live. As always in the fight game, nothing is final until the night. Maybe the whole thing is to drum up media attention. Yet, there is a possibility we could see a second UFC star step into the boxing arena. Only time will tell if both fighters sign the dotted line. Do you think the fight will happen? Let us know what you think in the comments.